DMM - 14 week intensive online training programme. Now excepting delegates for 11th March 2019 intake. Using online one to one coaching, live group training sessions, convenient video lessons and downloadable resources, you will become the ‘go to’ person in your organisation for digital media strategy and implementation. Learn strategies that specifically apply to your business, your sector and your goals. Participants spend time weekly with our Co-Founder and Training Director Jennifer for personalised training and support. Every session is tailored to you and your training & business needs. You will enjoy weekly, live online group lessons, extensive Q&A time with our trainers and consultants, video training lessons, assignments and planning templates. Unlike a traditional training course, you have time to learn, action, and follow up each aspect of the course curriculum. Instead of spending whole days at a time on one area of digital media, you will immerse yourself in all aspects over a 14 week period. 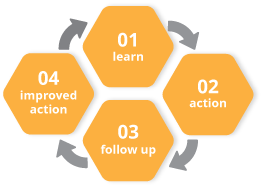 You are encouraged to follow this 4 step learning cycle to ensure the highest rate of information retention and success. Each week you will get a chance to learn something new, put it into action, follow up with questions and try that action again. After 14 weeks of doing this for every aspect of the course, you will be confident in your own expertise and have plenty of examples of success with digital marketing for your own business. Understand exactly how your accounts are progressing and what is worth spending your time on when it comes to social networking. Have confidence that you can run the account yourself at the end of six months if you choose to (there is an option to continue on if appropriate). Keep up to date with new developments so that you never feel out of your depth using social media. TwoBees has trained thousands of people in how to improve their social media presence and increase their expertise. Using our experience of what works, we can take the initial burden off your shoulders and support your long term social media strategy. This is a collaborative process which is specifically designed to build your confidence while also taking the bulk of the work off your hands. who want to excel in digital media strategy and implementation. who want to save time and money with digital communications tools. who want to lead their teams towards tangible success with digital marketing. who want to progress their career and run their own teams. who want to develop more in depth analytical and ROI driven campaigns. Do you want a bespoke DMM course for you business or department? If you love the idea of DMM but want a more bespoke programme for your staff, get in touch. We have already designed and delivered fully bespoke online training programmes for many of our clients and would be happy to talk through the options with you. We work together to identify all the areas most important to your staff and business needs and ensure all case studies and examples are relevant to your industry and specific sales proceses. A bespoke programmes is an excellent, cost-effective way to ensure all your staff have the training and support they need to help your business succeed. Why not email us and arrange a time to discuss your specific requirements. We begin the course by taking you through our proven strategic method for planning, implementing and measuring the success of your digital media activity, The Cube Method©. This ensures that all participants evaluate their choices through the critical eye of The Cube Method©. You will get complete clarity on your goals, who your target audience is, where they spend their time online and how you target them, what content is going to engage them most successfully and how to measure that success and continually improve upon it. We cover the full range of social networks from Facebook, twitter, LinkedIn and Instagram through to new and emerging platforms like Snapchat, Periscope and Facebook Live. Each platform has it’s own idiosyncrasies and different levels of sophistication when it comes to advertising and targeting. We take you through every element from organic reach to full conversion tracking. Your digital marketing is only as good as the content you have to share. And it’s no use having amazing content if no one sees it. We take you step by step through the fundamentals of content planning, creation, publishing and conversion tracking to ensure that you have the perfect balance of both. We introduce you to tools for creating great graphics, video and exciting copy and tell you how best to ensure your content is seen by your exact target audience. At every part of the course, we tackle how best to optimise your content and activity to improve search visibility for your website. We make SEO a natural part of your marketing so that it becomes second nature to you when planning your campaigns and running your regular communications channels. Email may have been around for a long time but it isn’t going anywhere. It’s one of the few places where you own your followers. If Facebook or twitter were to disappear tomorrow, your followers would go with them. Ensuring that you convert social followers and website visitors to your email list is key for long term leads and sales. We’ll take you through strategies for growing your emails lists and managing email campaigns to maximise conversions for your business. One of the biggest mistakes digital marketers make is not setting up the correct tracking for their online activity. You can’t measure what you don’t track and you can’t measure success if you don’t have a clear idea of what success looks like for your campaign. We will show you how to set up the correct tracking and measure the success of each of your digital marketing platforms. We’ll also show you how to connect that success to the activity on your website using Google Analytics. Every step of the way you will be measuring, analysing and improving your performance. You will put your learning into action straight away, in a real life setting and with continuous opportunity for support and troubleshooting. You'll never be out of date with the fundamental aspects of digital media marketing. You don't have to spend days out of the office and never have to travel to access the very best quality training and resources. You benefit from lifetime access to all course materials, including all upgrades and updates for future course participants. You get to control your personal development in digital media. "The benefits of doing [the course] over a 14 week period are that you get to spread your learning, try out all of the apps and tools that Jennifer recommends - if I'd done a 2 day intensive, it would have all been about the learning and not about the practical and I think that's what the beauty of this approach is! Genius!" "It allowed me to think outside the bubble I am forced to work in. Clear head space is a premium for me and this course really allowed me to think beyond the confines of my role. This course is a must for anyone who wants to get the most out of the tools and opportunities social media and digital media provides." "TwoBees training has been one of the most actionable training courses I've been on! Full of practical individual and group exercises, as well as real-life examples, they ensure that you leave the course inspired, educated and more confident." "A big hit for me is Jennifer's informal and approachable style. I understand everything she says, there's no jargon and she's genuinely keen to help people learn. Very inspiring." "The best social trainer I've experienced. Jennifer is worldclass!" "The course trainer was engaging, knowledgable and her enthusiasm was truly inspirational. I have taken loads away, she offered many tips and advised on relevant topics and made me look at online tools/applications in a completely different light." Choose the course membership that’s right for you and your business. If you want to be invoiced directly, please get in touch and we can arrange payment with your accounts department. The course starts on 10th October 2017 and runs until 4th February 2017. There is a 3 week break for Christmas from 12 December 2016 to 2nd January 2017. Still not sure if this course is for you? Why not email us and arrange a time to chat! Think we can help your organisation boost it's digital communication? Let's talk. If you're in London we'd love to meet up. We can discuss your specific requirements and see how we can help boost your marketing. delegates trained and hundreds of businesses, large and small, who have boosted their digital comms with our help.